This blog is for friends, family and for everyone who loves cupcakes. I love baking and spending time in the kitchen. I’m notorious for using every dish in the house and getting mixture on all the kicthen walls. 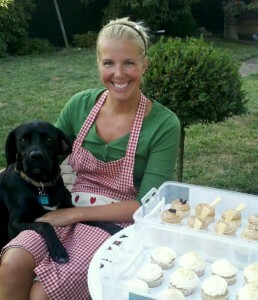 Luckily I have an assistant, Boris, to help out and a husband who helps clean up (and taste the baking goodies). I’m hoping to try out new recipes and creative decorating ideas and will be posting pictures & sometimes recipes. I am crazy about cupcakes (and cakes) – mini cupcakes, giant cupcakes, cupcakes in all flavours and sizes! I find them so ideal for all occasions. Maybe one day I will open a small boutique cupcake shop – I would absolutely love that – but I think I have many batches and recipe attempts to go before then. In the meantime I could perhaps start taking orders. Love that burguer cupcake! yum!